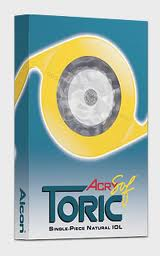 Lenses that correct for astigmatism are referred to as Toric IOLS. Patients who have astigmatism suffer from unfocused vision at all distances. This new lens technology can provide excellent distance vision without glasses. Standard intraocular lenses do not correct for any astigmatism, and patients must wear glasses for distance and near vision after cataract surgery. A comprehensive eye exam, precise measurements of the length of the eye, and corneal curvature are required to determine if a toric IOL is right for you.